Saturday: Partly cloudy, highs in the 80s. Saturday Night: Mostly clear. Lows in the 60s. Sunday: Mostly sunny, highs in the 80s. Sunshine Saturday morning will mixing with fair-weather clouds midday and afternoon, low humidity and high temperature in the 80s. Wind is mostly light from the northwest, so the beaches should be just about as warm as anywhere. Sunday is a bit more tricky, there will be another little pool of cool air trying to rotate south through the Gulf of Maine. This may produce an onshore breeze at the beach from Maine to eastern Massachusetts keeping us in the 70s. But for most of us high pressure to the south is in control and we will go to 85 to 90 degrees along and west of the Connecticut River under mostly sunny skies for all. Hot, to record hot is likely Monday. With the wind from the west, temperatures may exceed 95 degrees and break records. Sunshine will mix with clouds as a front from Canada triggers showers and thunderstorms during the afternoon from north to south. The front makes it to southern New England coast on Tuesday with a chance of heavy rain, and there will be some more thunder for Connecticut, Rhode Island, and Massachusetts. 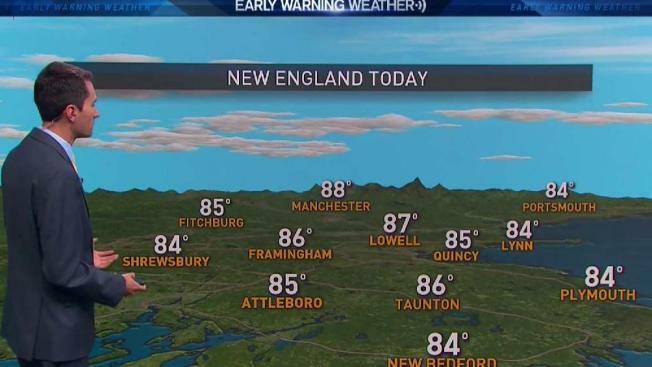 Northern New England should dry out on Tuesday with a high temperature in the 70s to 80 degrees. If there is any appreciable rain in the next seven days it looks like it would be Monday afternoon and Tuesday. Seasonable and mostly dry weather is likely to return for the middle and second half of next week.